I’ve sat down and figured out a release date for book two in the Visitors Trilogy, The Enemy. That’s the day I believe I can have it finished, edited, and ready to release. It’s going to be tough, but I believe I can do it. So get ready everybody! Only 11 weeks and one day (or 78 days) until book two comes out! Let me tell you, it’s going to blow you away! On this weeks episode, I talk about The Intruders going ong Barnes & Noble, Death Weeps and gushing about Tamara Rose Blodgett! Plus, Contagious by Emily Goodwin, The Enemy, and much more! To celebrate, The Intruders will be free for today only! Click HERE! Now go eat some Hot Dogs! Today I’m going to be introducing something to you guys that I’ve been wanting to do for a long time: a podcast. It’s called Diary of a Teenaged Author! 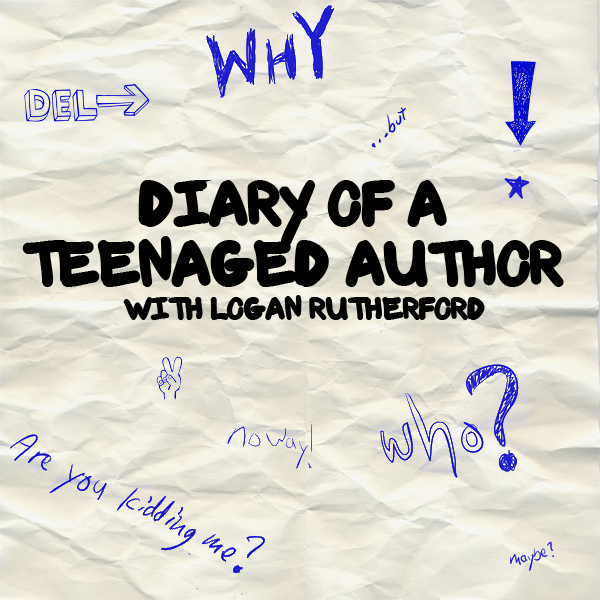 This podcast features news, reviews, and topics about writing, all from the perspective of seventeen-year-old author, Logan Rutherford! Basically, I’m going to be talking about what I’m reading, writing, and things about the industry. It’s kind of an easier way to let you guys know what’s going on with The Enemy, and all my other writing stuff. Plus, I love doing reviews, but hate writing them. This makes everything so much easier! The first episode is up right now, but you’re probably wondering “How to I listen to it?” Well, I’m gonna tell ya! First of all, it’s not on iTunes yet, but it will be in a couple of days. CLICK HERE FOR iTUNES! Once it is, all you have to do is search Diary of a Teenaged Author, and it’ll show up. Once you click on it, you can listen to it in iTunes, download it, or subscribe. If you subscribe (please do) new episodes will download as soon as they’re avaliable. Once downloaded, you can listen to it in iTunes, or drag and drop it onto your iPhone/iPad/iPod. You can subscribe to the RSS feed, download HERE or listen to it in the little player that I’m going to have in each post. That’s all there is to it! After you listen to it, please leave a review. That’d be awesome.